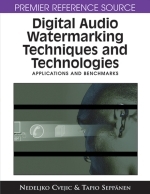 In this chapter, detailed explanations would be given on the role of echo hiding playing in audio watermarking, in terms of background, functions and applications. Additionally, a section is dedicated to discuss the various approaches proposed in the past to solve the flaws of echo hiding. Lastly, the proposed analysis-by-synthesis echo watermarking scheme based on interlaced kernels is introduced. Comparisons in audio quality and robustness performance are also looked at the proposed and conventional echo watermarking schemes.